In celebration of the upcoming Valentine’s Day holiday, Best Fiends developer, Seriously, has announced a themed competition in the line-drawing puzzle game. The “Best Fiends Forever” event runs through February 14, and will see popular YouTube stars competing against each other to complete the most levels within a limited amount of time. The game’s players can get in on the competition as well, challenging their loved ones to complete levels in order to help their favorite YouTube personalities. 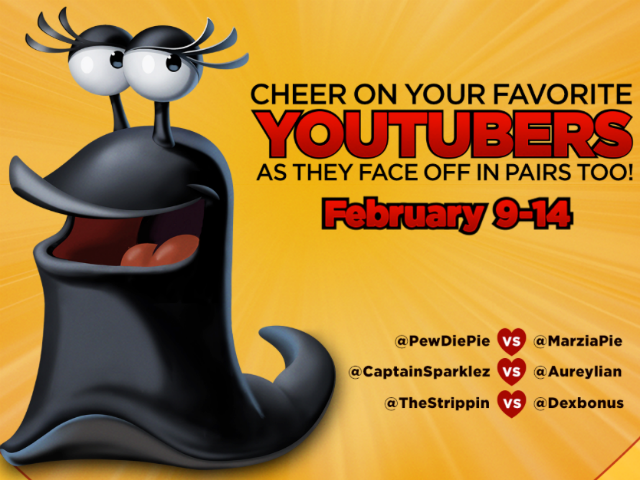 The Best Fiends Forever event will see PewDiePie competing against his girlfriend, CutiePieMarzia; CaptainSparklez will be playing against Aureylian; and TheStrippin will be competing against DexBonus. The player who completes the most levels by the end of the event will win. Fans can back their favorite YouTube stars by challenging other players to complete levels in their own competitions. Once these fan battles are complete, winners are encouraged to take screenshots of their in-game progress and upload them to Twitter using the hashtag #BestFiendsForever, along with a hashtag for the YouTube personality they’d like to support. User submissions are being accepted until 3:00 PM Eastern time on Valentine’s Day, February 14. Best Fiends is available to download for free on the iTunes App Store, Google Play and the Amazon Appstore. The level-based game sees players battling against monsters by making matches with different elemental symbols. Players must defeat all of a level’s monsters before running out of moves. Gamers receive currency over time, allowing them to make their own creatures stronger.